Published on August 25, 2009 by Wade Shepard Follow me on Twitter here. “Mi trabajo aqui es finito, yo voy a desaparecer como Jaime,” spoke El Salvadoreno after he brought his last batch of basil, mesclun, and squash in from out of the field and shipped it off to market. His work on the farm was now finished, the only thing left for him to do was disappear, like another farm hand did a few days earlier. El Salvadoreno slumped against an old brittle and rusted fence that encircled a chicken coop and let out a long sigh that seemed to speak the finality of the moment perfectly. El Salvadoreno’s work here was done, and I watched as he let the proceeding 5 years go in that single exhalation. He was being deported — “voluntarily” — back to his homeland, El Salvador. I looked upon my friend for what I knew could be the last time, as he looked out across these fields for what was clearly the last time. I stood next to him, and both of us, without speaking, breathed deep and looked around the farm searching for the words to proclaim the feelings we felt. The clouds moved by slowly, the sun broke through them gently, and the wind puffed cooling breathes over The Farm. Time was passing, and El Salvadoreno and I shrugged our shoulders in the face of this onward roll, smiled sweetly, and did not say too much. Perhaps we were looking for the words to say goodbye, perhaps we were searching for the words to explain the bookmarks of time that imprint themselves into a man’s soul. Perhaps there was just little more to say. “I am no more,” El Salvadoreno spoke in his native tongue. “Te voy a recordar,” I said without knowing the proper way to say “I will miss you” in Spanish. He then gave me a few last farming instructions, and left the reigns behind. If El Salvadoreno’s story could be said to be typical for his people in the USA it is still extraordinary. I have pieced the tale of his coming to the USA together from a handful of conversations that I have had with him in Spanish over the months we worked in the fields together, as well as through talks with the farm owner, with whom El Salvadoreno lived and worked with for five years. I am unsure about how this story really played itself out, as Latin men — as well as men almost everywhere — often have the tendency of not taking humiliation lightly, and often tell stories in a way that leaves their pride still in tact. Or perhaps they tell their harsh tales in ways that they feel their listeners would be most comfortable hearing — the story they think we want to hear. I am sure El Salvadoreno masked many indecencies with the simple words “muy malo” — very bad, but the following is what I have been able to roughly assemble. “For three days we walked without any water,” El Salvadoreno told me how he entered the USA. “Yes,” he answered in the affirmative, and then told me how thirsty he was in his desert crossing with a laugh. “Muy dificil, muy duro,” he added. 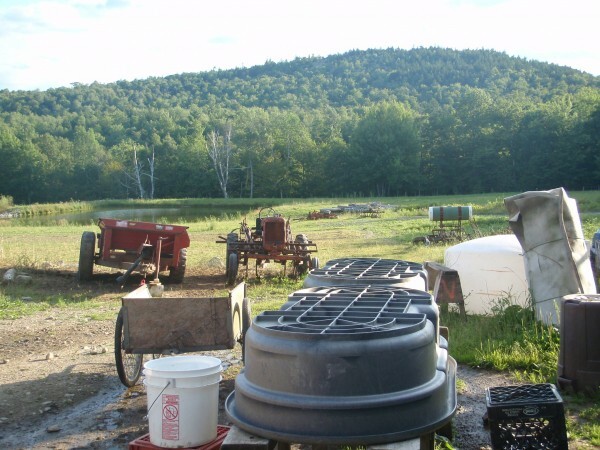 In this moment I looked out over fields in Maine that had seen far too much watering this season, and the story I was hearing almost surreally mixed in with our landscape. But regardless of the fact that we were standing wet in the rain, I could tell that El Salvadoreno remembered his entry to the USA almost too well. He preserved through the desert by the highest definition of the phrase. After paying a relatively large amount of money to a group of smugglers, El Salvadoreno left his 6 children and wife behind and struck out to try his hand at working in the USA, which has almost become a right of passage for men in his country. Knowing that no visa could be had to enter the country legally, he set off to chase the beacon of work and a living wage under the cover of the black market system that criss crosses the major population centers and agricultural expanses of the USA from end to end. He found himself stuffed in the trunk of a car. Through at least two 24 hour+ car rides El Salvadoreno rode in the far back. One of these rides was a 36 hour haul from the southwestern desert to Boston. It is my impression that El Salvadoreno did not see too much on his first tour of the USA. Once in Boston — or somewhere else en route — El Salvadoreno was able to procure counterfeit “papers” for $1500, and sought to travel up to Caribou to work the broccoli harvest with a van full of other illegally “papered” Salvadoreans. Somewhere upon crossing into Maine and the northern stretch of Caribou, the van was apprehended by police, who correctly identified the group’s papers as being false. The entire contingent was promptly sent to jail in Bangor. This is how El Salvadoreno ended up in Maine. But the wheels of justice soon found themselves clogged, as they had a group of Salvadorean immigrants in custody who did not speak English and nobody on staff to translate. For three days the immigrants sat in detention — in absolute limbo — until an adequate Spanish speaker could be found. Soon enough, federal immigration officials took this case off the hands of local law enforcement, and the false documents rose to the forefront of the investigation. Rather than sending the immigrants immediately back to El Salvador, they offered them a deal: they could legally stay in the USA until the case in connection with the faux papers was resolved. The group of immigrants accepted these terms. Ironically, the group’s illegal papers ended up being the key to their acquisition of legal status in the USA. The immigrants would be granted temporary legal status to reside in the United States, but they would not be permitted to work. Luckily a representative for a homeless shelter in Bangor caught wind of this group of immigrants who had no place to go, and no means to get there even if they had. This lady took the Salvadoreans in and, seemingly, facilitated a way for them to be able to work legally in the USA. Once the social security numbers were dolled out, the immigrants were assisted in finding work. This was how El Salvadoreno ended up on the farm. For what seemed like an indefinite amount of time, El Salvadoreno worked on the farm 10 to 12 hours a day, 6 days a week making as much money as he could and sending most of it home to his wife and six children. Though teetering on the border of illiteracy, and having never attended a day of school in his life, El Salvadoreno found a valuable nitch for himself in the USA. El Salvadoreno had been working on farms since he was ten years old, and knew the tidings of agriculture inside and out. He soon became the farmer’s right hand man, and took on a lion’s share of responsibility for the farm. El Salvadoreno knew exactly when to plant each crop, exactly when to harvest it, and new almost exactly how much of a yield he could bring in off of a field of plants. It was amazing for me to watch El Salvadoreno look over a 50 foot row of mesclun and know almost exactly how many boxes it would fill and how much it would weigh. He tried to teach me his formula, but I quickly realized that it would take me 30 years of practice to be able to come even remotely close to his knowledge of farming. Simply put, a touch of the Soil was in his blood. El Salvadoreno is now on his way back to El Salvador, back to his large family, back to his own farm. Earlier this year the farmer brought El Salvadoreno into the immigration office to renew his visa — just as he had each of the previous 5 years that he worked for him. Only this year they notified them that his visa would not be renewed: he had to get out. The case against the green card forger had been resolved. El Salvadoreno must go back to El Salvador. The farmer then ran a course through the legal circles and tried hard to find a way for his top Latino hand to continue working for him. 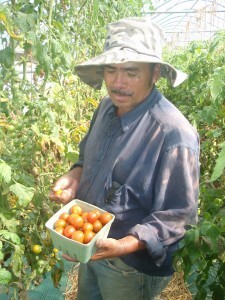 The farm became dependent on El Salvadoreno, to lose him would impact a small American business drastically. 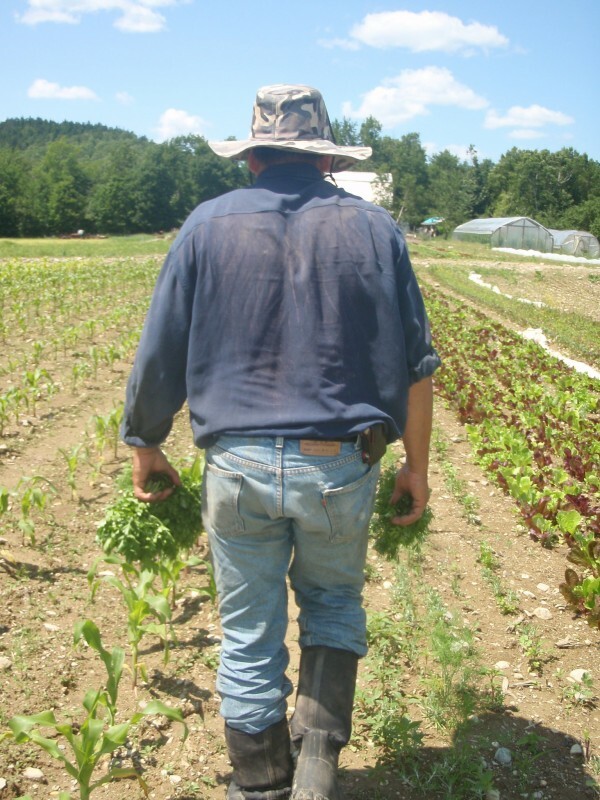 The farmer tried to get him an agricultural worker visa, and immigration said no way; the farmer applied for a foreign expert visa, and immigration said no way; the farmer tried just about everything, and could only finagle a 6 month extension for his top man. “I was actually surprised that we got that,” the farmer later told me. This was all that could be done for El Salvadoreno: 6 more months in the USA, and then he had to get out or risk becoming illegal yet again. The message was clear, El Salvadoreno had to be out of the USA by the end of August: he was served his “voluntary” deportation, which he signed and agreed to. If he did not leave the country by this time, he, apparently, would be involuntarily deported — which means jail and a guarantee that he could never come back to the USA legally ever again. Though I could not help but to note that this threat is often preemptively in place right from the start. This is why men feel compelled to spend their life’s savings, ride in trunks of cars, and walk across deserts to come to the USA — for they could never get in any other way. The economic lure of available, immigrant centric jobs and higher wages is often worth the risks of the journey. Though the fact that he would soon be “voluntary” deported tasted a little bitter, a sweet nostalgia or home seemed to assert itself in El Salvadoreno’s conversations with me. In the week leading up to his departure from the farm, I started noticing the sparkle in his eyes when he spoke of his life in El Salvador — the life he was returning to. One day he pointed to two trees that grew within a couple feet of each other and told me about how the forests around his home had trees that were much bigger than both of them combined. He then spread his arms out as wide as they could go and demonstrated that a man could not even wrap his appendages around their trunks. As he told me this he smiled. He was going back to his mountain home of forests and giant trees. There will be a very large fiesta for El Salvadoreno when he returns to his village. He told me this with a huge smile, and then walked across the fields one last time to his little hut near the wood line, packed up everything that he acquired from five years of living in the USA into two small suitcases, and departed for home a hero. Great title, great story, great meaning. Amazing how many countries depend on migrant work. Bend the rules when needed, and then deport. From nations that were built on such workers – its a shame. I know in my own search i am now deemed too old for some working visas. Madness in a world getting smaller. By the way did you get my email last week? Check spam folder! I never received your email! Or maybe the spam monster ate it up already. Is there any way that you could send it to me again? Just sent you something to the address on this site. Can’t remember if we used a different one last time. Anyway check your spam and put me in the good books of your email! Love this read! Just wondering if you ever went to visit? I just came back from a 4 month visit to El Salvador. Do you have any new information about El Salvadoreno?? I’ll put it this way: he got a little lost on his way home. When I got to El Salvador the word was that he hadn’t made it yet. Oh wow. I can only guess what happened. Thanks for the reply.